Digital offices depend entirely on the smooth flow of information. You need to be able to get information into the right hands fast. That's why at the center of a seamless office you'll almost certainly find a 7145. 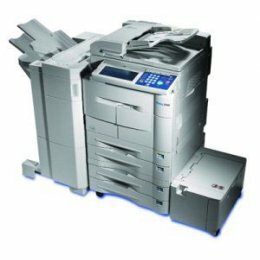 With direct networking capability, the 7145 synergizes online printing, scanning, copying, faxing and even document finishing to create a seamless flow of information throughout your office and beyond. Network Print, Scan to email/file/folder, Fax, Document Server, Staple/Sort/Collate/Hole Punch. 30,000 prints/copies per bottle of toner.